How can I change the color of that dark layer of Turn Off the Lights? /Browser extension /How can I change the color of that dark layer of Turn Off the Lights? You wan to change the color of that dark layer? In the Turn Off the Lights options page you can change the default black color to one of the thousand colors such as green, red, orange, yellow, purple, white or blue. 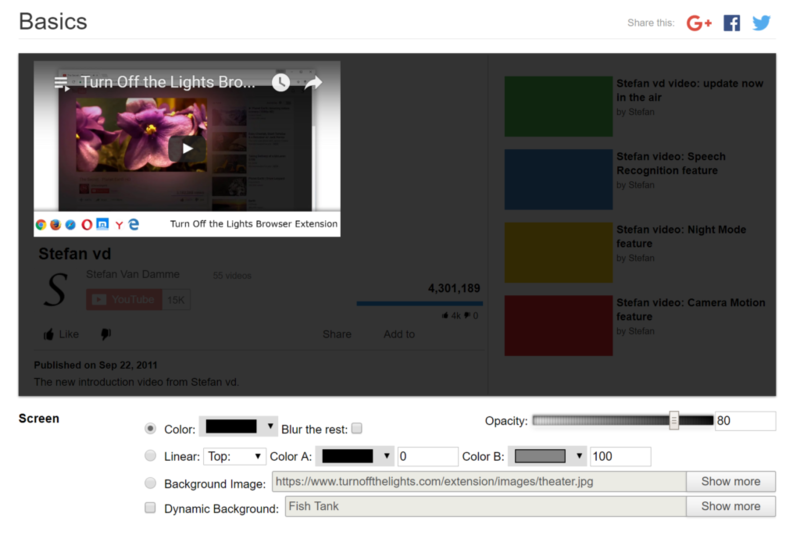 Or yourself can choose an own background image as layer of this extension. You can customize this browser extension in all ways to make it so comfortable for you. Safari click in the Mac OSX menu bar on the “Safari” then click on “Preference”. And in the preference panel from Safari click on the “Extensions” tab. Click on the “Options” button. a) An one solid color, example green. b) A lineair gradient color, example from dark gray to black. c) A background image, your beach wallpaper in France. Close the web page to save the settings. Also on this web page location you can increase or decrease the value of the opacity by moving the slider right of the color box.